Lessons to be learned from Jermaine Jones’ early elimination from American Idol? Don’t lie to cops and don’t lie to show producers. Even though America thought long and hard about their votes for the top American Idol contestants, one will be departing earlier than expected. 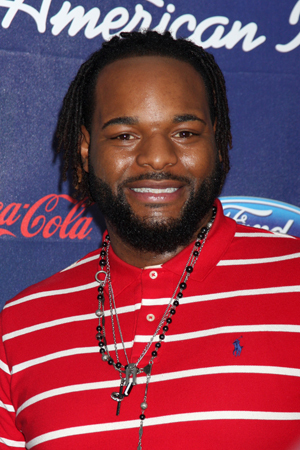 Jermaine Jones has been asked to leave the singing competition because he concealed an alleged criminal past from show producers. According to TMZ, producers learned on Tuesday that Jermaine omitted the fact that he was arrested twice last year and has outstanding warrants. Jermaine allegedly gave the police fake names both times he was arrested, and one of the incidents involved violence. Producers chose to give Jermaine’s background a deeper investigation when Jermaine was caught in a lie about his father abandoning him 10 years ago — his father testified that they see each other regularly! Idol personnel became generally suspicious of the contestant and conducted a more thorough background check, which revealed the truths that disqualify him from the competition. Just hours before news of his exit hit the internet, E! News chatted with Jones about how excited he was for his upcoming performance. “I think the song I did choose for this week; it fits my voice very well. I made it my own and it really feels good to me,” he said. “I feel good about this week.” Looks like his intuition was wrong about this one. Though we won’t be able to hear the song he had planned, footage of Jermaine Jones will appear on the show tonight, as he was confronted about the situation on camera.